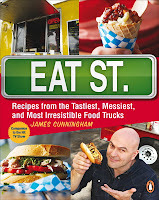 Companion to the Food Network Canada TV show of the same name, this book includes over 100 recipes collected from vendors in Canada, the US, and England. Hot dogs, tacos, maple bacon cupcakes – there’s something to tempt everyone. 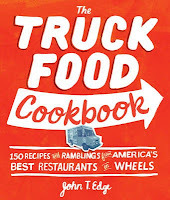 But this book is more than just recipes – it also tells you how to find the featured trucks. So you can read it to plan a meal or plan a trip. In another recipes-and-then-some book, New York Times food writer John T. Edge chronicles his culinary travels in the USA, and examines the culture and ethics of street-side dining. Recipes that the cooks wouldn’t divulge were recreated in order to offer a how-to facsimile. Maybe after some time in the kitchen, you decide you want to start your own food truck. No problem! 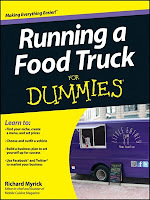 Check out Running a Food Truck for Dummies (M) by Richard Myrick published in 2012. And whether you’re an entrepreneur, or just hungry, the local food trucks rely heavily on social media to let people know what’s on the menu, and where they’re located. If you’re still not sure how Twitter works, a good place to start would be, The Twitter Book (M) by Tim O'Reilly and Sarah Milstein, or Twitter: tips, tricks and tweets (M) by Paul McFedries. Happy eating, reading and tweeting!